Nothing matches the form and function of an Italian beauty like the Ducati Monster. Available in two guises, the Monster 821 and the Monster 1200. With features like multiple riding modes, traction control and ABS, the Monster is fun but versatile enough for daily use. 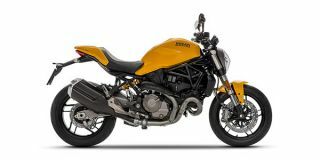 The prices for the Monster 821 start from INR 9.80 Lac, ex-showroom, New Delhi. Q. I am planning to buy an monster 821 but also have kawasaki z900 in mind. Which is a better option. Kindly guide me!! Q. How many people can seat on it ? Q. Maintenance cost and maintenance schedule? Q. Does the Ducati Monster 821 have riding modes? Depends on which city your buying from. Q. Should go for Ducati monster 821 or street tripple rs? Is the mid-sized Monster good enough to go head-to-head against some of the segment’s best naked motorcycles? The mid-size Monster gets a host of updates and new features!